The Mil Mi-26 (Russian Ми-26, NATO reporting name "Halo") is a Soviet/Russian heavy transport helicopter. It is in service with civilian and military operators. It is the largest and most powerful helicopter ever to have gone into production. Following the incomplete development of the Mi-12 in the early 1970s, work began on a new heavy lift helicopter, designated "Project 90", later allocated designation Mi-26. The new design was required to have an empty weight be less than half its maximum takeoff weight. The helicopter was designed by Marat Tishchenko, prot�g� of Mikhail Mil, founder of the Mil design bureau OKB. The Mi-26 was designed as a heavy-lift helicopter intended for military and civil use. It was designed to replace the earlier Mi-6 and Mi-12 heavy lift helicopters, with a design that had twice the cabin space and payload of the Mi-6, then the world's largest and fastest production helicopter. The primary purpose was to move military equipment such as 13 metric ton (29,000 lb) amphibious armored personnel carriers, as well as move mobile ballistic missiles to remote locations after delivery by military transport planes, such as an Antonov An-22 or Ilyushin Il-76. The first Mi-26 flew on 14 December 1977. The first production aircraft serial 01-01 was rolled out on the 4 October 1980. One production aircraft was destroyed during emergency landing procedure testing (pre-delivery) with a single engine, however there were no casualties. Development was completed in 1983 and it was in Soviet military and commercial service in 1985. The Mi-26 was the first helicopter equipped from the factory with an eight-blade rotor. It is capable of single-engine flight in the event of loss of power by one engine (depending on aircraft mission weight) because of an engine load sharing system. 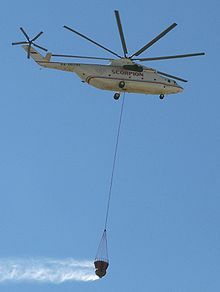 While it is only slightly heavier than the Mi-6, it can lift up to 20 metric tons (44,000 lb) - 8 tons more than Mi-6. The Mi-26 is the second largest and heaviest helicopter ever constructed, following the experimental Mi-12. In July 2010, a Russian-Chinese development of a successor type was announced. Picture - A Soviet Mil Mi-26 helicopter participating in the Chernobyl nuclear reactor clean-up operation. 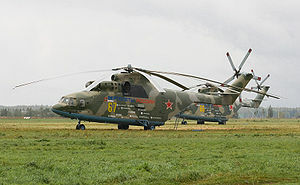 The Mi-26S was a hastily developed version for disaster relief tasks following the Chernobyl nuclear facility accident. This version was used for measuring radiation levels and for precisely dropping insulating components while blocking the damaged No. 4 reactor . It was also equipped with deactivating liquid tank and underbelly spraying apparatus. The Mi-26S helicopter was operated in immediate proximity to a nuclear reactor. The filter system and protective screens mounted in the cabin protected the crew during the delivery of construction materials to the most dangerous zone, the zero point of the catastrophe. For three weeks in September 1996, the Russian military loaned four fully crewed Mi-26 helicopters, along with their airbase in Anapa, for the World Team’s attempt to set a new skydiving freefall formation world record. The World Team, led by Hollywood aerial stuntman B. J. Worth, is an international collection of some of the best skydivers from over 40 nations from around the world. The team’s goal in Anapa was to set a new world record 300-Way freefall formation utilizing the high altitude and high capacity of the Mi-26. In order to achieve this record, the World Team needed to get 300 participants plus aerial judges, photographers and cinematographers up to 6,700 metres (22,000 ft) quickly, and then simultaneously drop them all in to a tight formation. Having never attempted this type of close formation flying before, the Russian pilots and their Mi-26 helicopters performed flawlessly. While the goal of 300 skydivers locked in formation wasn’t achieved during these attempts, the Mi-26 did fly away with a new World Record 297-Way set on September 27, 1996. In October 1999 a Mi-26 was employed to transport a 25 ton block of ice encasing a well preserved 23,000 year old Woolly Mammoth from the Siberian tundra to a lab in Khatanga, Taymyr Autonomous Okrug, where scientists hoped to study the find and perhaps try cloning it. The weight was so great that the Mi-26 had to be returned to the factory immediately after the lift to check for structural excesses that could have warped the airframe and rotors. In spring 2002 a civilian Mi-26 was leased to recover two U.S. Army MH-47E Chinook helicopters from a mountain in Afghanistan. The Chinooks were being operated by 160th Special Operations Aviation Regiment and had been employed in Operation Anaconda, an effort in early March to drive al Qaeda and Taliban fighters out of the Shahi-Kot Valley and surrounding mountains. The MH-47s ended up stranded on the slopes above Sirkhankel at an altitude of 2,600 metres (8,500 ft) and 3,100 metres (10,200 ft). The Chinook stranded at 3,100 meters was deemed too badly damaged to recover, but the other one at 2,600 meters was repairable. With all fuel, rotors and non-essential equipment removed the Chinook was estimated to weigh 12,000 kilograms (26,000 lb), which exceeds CH-47's payload of 9,100 kilograms (20,000 lb) at that altitude (2,600 metres (8,500 ft)). An Mi-26 was located through Skylink Aviation in Toronto, which had connections with a Russian company called Sportsflite that operated three civilian versions of the Mi-26 called Heavycopters. One of the aircraft was in Tajikistan doing construction and firefighting work. The aircraft was leased for the recovery for $300,000. The Chinook was snatched with a hook and flown to Kabul, then later to Bagram Air Force Base in Parvan, Afghanistan for shipment to Fort Campbell, Kentucky for repairs. Six months later a second Army CH-47 that had made a hard landing 100 miles north of Bagram at an altitude of 1,200 metres (3,900 ft) was recovered by another Heavycopter operated by Sportsflite. On 19 August 2002, Chechen separatists hit an Mi-26 with a surface to air missile, causing it to crash-land in a minefield. Reportedly, a total of 127 people on-board were killed in the crash. As the result of the magnitude 8.0 Sichuan earthquake on 12 May 2008, many rivers became blocked by giant landslides, which resulted in the formation of "quake lakes"; massive amounts of water pooling up at a very high rate behind the landslide-formed dams which will eventually crumble under the weight of the ever increasing water mass, endangering the lives of potentially millions of people if the water is to build up, and then break downstream. The most precarious of these quake-lakes is the one located in the extremely difficult terrain at Tangjiashan mountain, accessible only by foot or air, in which at least one Mi-26 heavy lift helicopter belonging to a branch of China's civil aviation service is used to bring heavy earthmoving tractors to the affected location. This was in conjunction with PLAAF Mil Mi-17 helicopters bringing in combat engineers, explosive specialists, and other personnel to join 1,200 soldiers who had already arrived on site by foot. Five tons of fuel to operate the machinery had also been airlifted onto location, where a sluice was constructed to allow the bleeding off of the bottlenecked water. A Moldovan Mi-26 belonging to Pectox-Air aviation was shot down in Helmand province with the loss of six Ukrainian crew. The aircraft was said to be on a humanitarian mission and was under NATO contract. (NATO - 'Halo-A') Military cargo/freight transport version. Upgraded version with an upgraded flight/navigation system. Upgraded version of the Mi-26, designed for better performance. Passenger transport version, with accommodation for 63 passengers. Export version of the Mi-26T. Proposed airborne command post variant, two prototypes built. Belarusian Air Force has 13 aircraft in inventory as of November 2008. Royal Cambodian Air Force has two Mi-26s in use as of January 2010. 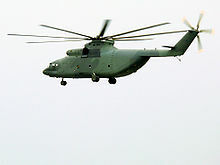 Air Force of the Democratic Republic of the Congo received one Mi-26, and has one in service as of November 2008. Indian Air Force has eight Mi26s in use as of November 2008. Kazakh Air and Air Defense Forces has 22 in service as of November 2008. Mexican Air Force Received 2 aircraft. Has one Mi-26 in inventory as of November 2008. North Korean Air Force operates four aircraft. Peruvian Army has 2 aircraft in service as of November 2008. Russian Air Force operates 25 aircraft. Soviet Air Force and Soviet Army Aviation passed their aircraft to successor states. Ukrainian Ground Forces has 25 Mi-26s in inventory as of November 2008. Venezuelan Air Force operates two aircraft as of November 2008. Rent Helicopters operates one Mi-26s built in USSR. Skytech offers charters of Mi-26 and other USSR-built helicopters. They used to have 2 Mi-26s based at Charleroi-Gosselies EBCI airport. China Flying Dragon Aviation operates two Mi-26T. Croft, John (July 2006). "We Haul It All". Air & Space 21 (2): 28-33.